As in other states, many Californians feel they are getting left behind. Increasing housing, energy, education and health care costs are eroding their financial stability. And unless they have specialized skills, global competition and automation endanger their jobs and cap their wages. But these conditions are not beyond our control. California can and should develop a public strategy for reviving economic opportunity and resiliency in urban and rural, north and south, inland and coastal California. Californians know how to innovate, how to be entrepreneurial, and how to use technology to create well-paying jobs. The state’s diverse regional economies reflect the nation and world. And our values – including our commitment to sustainability and social inclusion – inspire us to lead and position us to chart a course for parts of the nation paralyzed by economic stagnation and the ensuing political backbiting. CA Fwd and the California Economic Summit seek to do our part by curating a thoughtful and respectful dialogue among California's creative leaders. What do we need to do to position California to thrive -- to be more competitive, more sustainable and more equitable -- in a low-carbon, high-tech and increasingly connected world? What do you think? 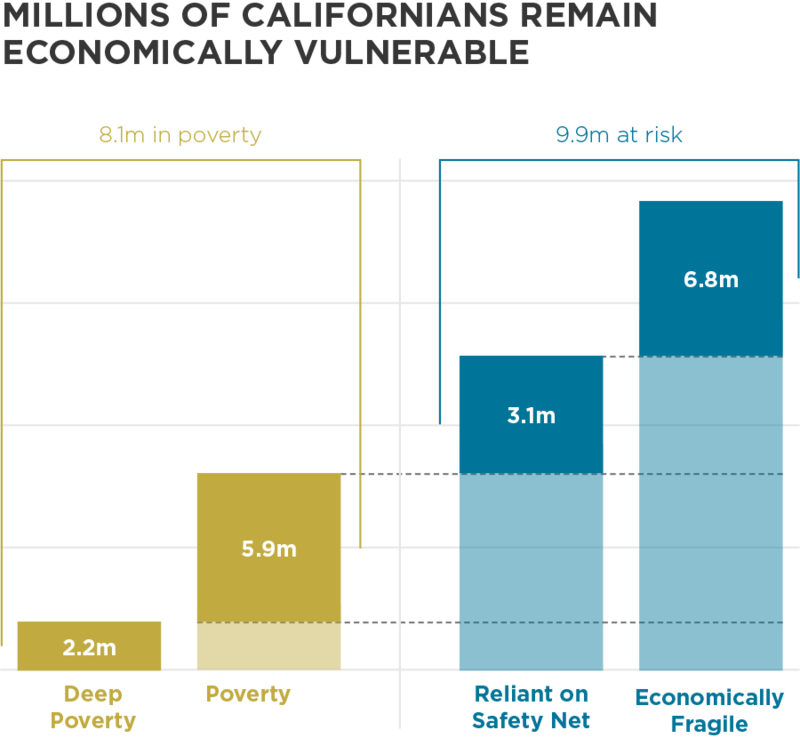 Poverty and income data from 2010-2014 show 8.1 million Californians live in poverty. Another 3.1 million rely on social programs to stay above the poverty line and 6.8 million are barely able to make ends meet. Data source: Poverty Measure from Stanford/PPIC data; Middle income from HUD and analysis. This is not just a California problem to be sure. Other states and nations are grappling with rising income inequality and the dislocation of post-industrial regional economies. But the federal government couldn't solve this problem -- even if Washington, D.C. was not in gridlock. Most of the policy levers are at the regional and community levels. Progress toward those challenges must continue, while at the same time, we are rigorous in assessing what else must be done to make sure all Californians have a shot at economic security. No single organization, government agency, corporation or political party can solve this problem. It will take a collective effort. It will need steward leaders from across the spectrum who are willing to work together for that common purpose. Read about the 2017 California Economic Summit in San Diego, where attendees took the opportunity to start creating a plan to move forward in 2018. WHY CALIFORNIA FORWARD AND THE CALIFORNIA ECONOMIC SUMMIT? The Summit - with its regional infrastructure and state influence - is well positioned to develop and promote a unifying approach to this issue. The Summit’s triple bottom line approach of balancing economic growth, environmental protection and equal opportunities for every Californian is the best framework for developing effective solutions. People who are concerned about the future of the Golden State — foundations, business leaders, labor leaders — have already expressed interest in supporting this effort. You can contribute to this work by identifying California voices who can add content to this ambitious project or through your financial support.